Anyone want to do some transcribing? A little back­ground first. Neil Ayres — author, friend of this blog, and cyber-hench­man for the Blue Pootle — is about to launch an online ven­ture that may (or may not be) a magazine devoted to magic­al real­ism and/or light fantasy. Neil has asked me to con­trib­ute an art­icle based on my inter­view with David Mitchell (which is avail­able from here). The thing is, what with my ten­o­syniv­it­is (trans­la­tion: my wrist ten­dons are inflamed), I’m not able to tran­scribe it. I need a won­der­ful read­er of this blog to volun­teer. I hear your sar­don­ic chuckle. But wait! Remember what I was say­ing last time about the lim­ited avail­ab­il­ity of Déjà Vu, and how it’ll cost you an arm and leg to get hold of a copy? Well, the per­son who tran­scribes this inter­view will receive a free copy of the Déjà Vu: Special Edition. This spe­cial edi­tion is a phys­ic­al per­fect-bound book. The text has been revised. It has no ISBN. There will prob­ably be no more than three cop­ies of it prin­ted, ever. Sound tempt­ing? Leave a com­ment. You’ll have to tran­scribe using the audio file here and the dead­line is September 7th. Hi Ian, when would the tran­scrip­tion need to be ready by, and is it from audio or from hand­writ­ten notes? des­pite my over­flow­ing in-tray, over­due art­icles and (holy cra­pola, its only a week till the end of the month?!) — unfin­ished chapters, a nice shiny-new (signed, if you don’t mind?) 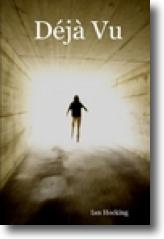 copy of Deja Vu … how can I res­ist? There’s always some­thing spe­cial about a book that has been in its author’s hands, I think. Shoot me an email if you’d like me to go ahead, just in case someone has been in touch about it in the mean­time. Oh, you drive a hard bar­gain, my post­mod­ern friend. Is there any chance you’d be OK with a non-signed copy? Otherwise I’ll have to pay P&P twice and I’m poor as a church mouse right now (thanks to the impend­ing house move). Wonder if I have an English spellcheck­er. I’ve been writ­ing Americanese for so long I for­get how to spell things prop­erly. Great, Helen! If you could send me an email with the tran­script (as a script, with dia­logue marked by speak­er) by the 7th, that would be great. I’ll take a look at the post­age for Oz — I’m pretty sure it isn’t much, and I’ll try to sign the copy for you. Previous Previous post: Plus your life!